Photos: Alex Hevesy. I only had my potato phone camera with me. Shortly before falling into a sodium-induced coma after some particularly bad McDonald’s, on Friday afternoon I spotted something small and red zipping down the road. It didn’t have any badges on it, but I knew exactly what it was. It was a Geo Metro convertible. The Metro pulled into the parking lot of Lowe’s, and after a few minutes, I found the owner, who was more than happy to talk about his car. Given their original status as almost disposable city cars, Metros aren’t that common anymore. The owner explained that he bought this little Suzuki Cultus-variant because it’s a cheap, useful little car for around-town cruising, and it certainly turns heads. He also said that people often have no idea what kind of car it is, so he just tells them it’s a lesser know Ferrari. This Metro is powered by a one-liter inline three that he says “can barely get out of its own way.” It’s assisted by some go-fast bits from a Ford Fiesta motor, but he assured me that it is not a fast vehicle by any means. Almost every modification to the car actually is there for a reason (that’s more than I can say about the roof rack on my Camry, which is only there because I think it looks cool), with that reason usually being that the parts looked cool or were cheaper than the real replacement components. The Metro’s half-moon hubcaps, for example, were cheap and easy to find for the 13-inch wheels. From what I remember, Metros didn’t come with a tow bar or rally lights in the front, and the owner explained that when he gets his pickup serviced at the dealership, he attaches the Metro to his truck, brings both to the dealership, leaves the truck and drives the Metro home. That’s pretty clever. It helps that the Geo is small enough that you can pretty much tow it around with anything that has wheels. He further explained that the car’s striking red color is due to a Maaco paint job, and he removed the badges just to stream-line the look. It could be that I’m a sucker for crappy 90s economy cars, but the red honestly doesn’t look bad. Automakers need to make more tiny red convertibles that aren’t the Miata. 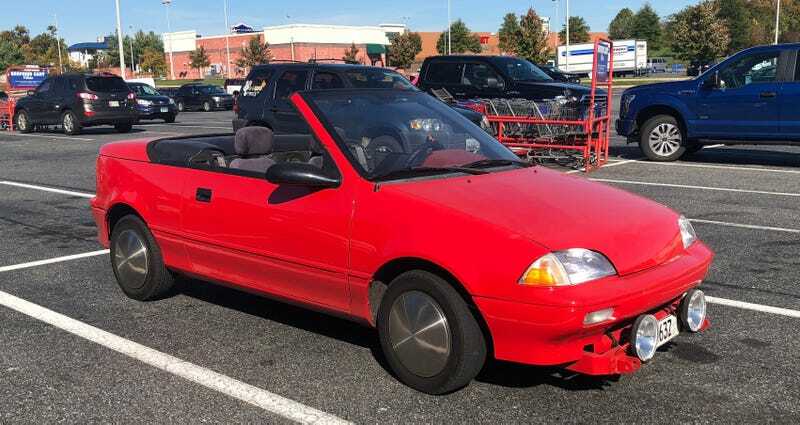 For $6,000, Would You Say Ka-Chow To This 1993 Geo Metro Cars Homage Business Opportunity?